« Portrait of Chico—-Special investigative reporter for Blogfinger.net. He’s got a nose for news. Zorba’s Brother and political correctness at Princeton. Zorba’s Brother—-a plain Jane diner style Greek restaurant on Nassau Street in Princeton. April, 2015. Paul Goldfinger photo ©. By Paul Goldfinger, Editor at Blogfinger. Re-posted from 2015. In Princeton, you expect eateries that reflect the Ivy League pedigree of the place. The fancy Nassau Inn is on Palmer Square in addition to a trendy coffee shop, a fine chocolate store and an ice cream parlor that serves their goods on the soft side. There also is a lacrosse store and a Barbour shop that carries high brow sporty clothes from England. But right across from that amazing opulent campus is Zorba’s Brother. It wasn’t crowded, but it was very appealing because of its simplicity. Music from the show Zorba played in the background. We had Greek lemon soup and the lunch special—fish and chips. The coffee was so-so. Have the Greeks forgotten how to make coffee? Carl, my “date” from Mt. Tabor Way, went with me to see a photography exhibit at the Princeton University Art Museum. We walked on the magnificent campus and took some photographs. It was a glorious morning. Those old buildings were accompanied by newly flowering trees, and it was all very lovely. Everyone there seemed well behaved and most walked on the pathways instead of on the grass. No one smoked cigarettes and no one swore. Small clumps of visitors were taking tours, and some high school kids got to sit on the tigers in front of Nassau Hall. I saw a student with a violin and one with a cello. So that’s how those two got in, thought I. Two students came by on skateboards. Do they have a skateboard team at Princeton? All those kids must have gold-plated extracurricular activites in their resumes. Inside the museum, a guard warned us not to take pictures of the traveling exhibits. Then he wanted to discuses race relations in America because I was looking at videos of the 1968 Chicago riots at the Democratic convention. Carl and I stared at the naked gorgeous Diana who was up on a pedestal shooting a bow and arrow. She was hunting. I did a 360 around her, but didn’t dwell on it. After all, this is Princeton! But the Greeks did have naughty goddesses, and Diana’s SAT’s must have been quite good, and how many applicants can hit a rabbit at 50 yards with a bow and arrow while standing on one leg? 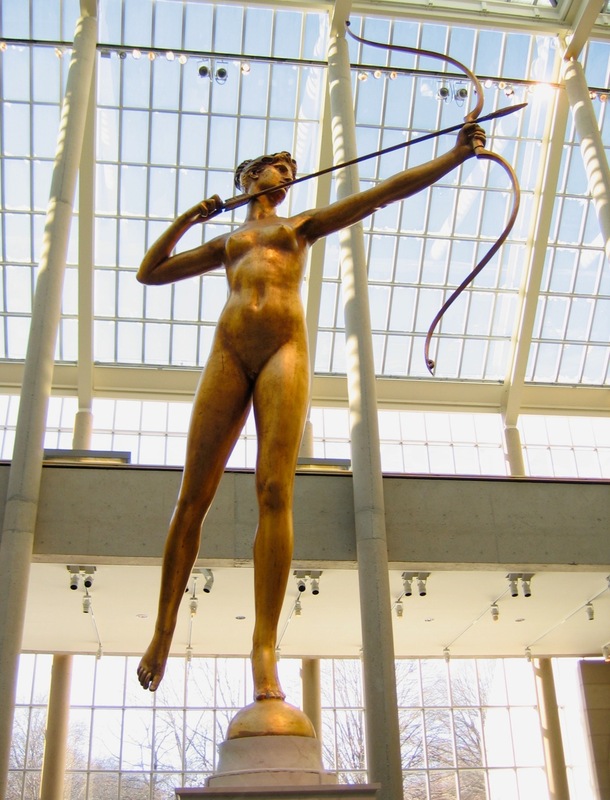 Diana at the Metropolitan Museum of Art. She has excellent form shooting on one leg. . Internet photo. It seems that political correctness is in the limelight at U. If any parents are planning to spend about 1/4 million bucks for their kid to go to Princeton, they might want to read that newspaper first. Carl and I decided not to apply to the U. Naked Diana is in the museum—-outrageous!